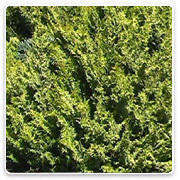 The emerald green arborvitae is an evergreen tree with bright emerald green foliage. 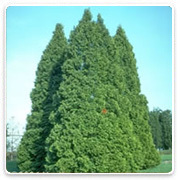 The emerald arborvitae can reach a height of thirty feet and have a spread of about eight to ten feet. They make an excellent screen, and can grow at a rate of about four feet per year. 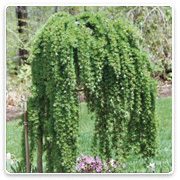 When young, the emerald arborvitae has a bright green color to its foliage which darkens as the plant ages. 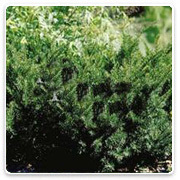 Small evergreen shrub has dense, globe shaped growth habit. 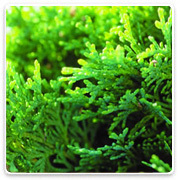 Rich green needles are arranged in flat layered sprays. Its low, compact form make this a popular accent plant for mixed borders or containers. Very adaptable, tough, durable plant. Evergreen shrub. Full to partial sun. Grows slowly to 3 to 4 feet tall and as wide. 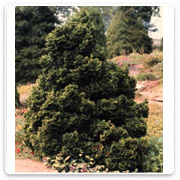 The Holmstrup Arborvitae, Thuja occidentalis 'Holmstrup', is a compact evergreen with dense branching which creates a pyramidal form. 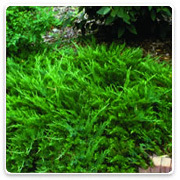 The bright green color and light bushy foliage gives this plant a textured appearance in the landscape. The Holmstrup does well in light shade and tolerates poor drainage. Nigra is a pyramidal shrub with dark green leaves. In general, this conifer is a tall columnar to conical, evergreen tree with fissured, reddish bark. Scale-like leaves are ovate, mid to dark-green on top, lighter beneath. Females bear small cones with a small terminal hook on each scale. 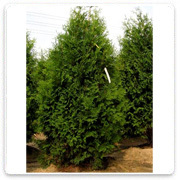 The techny arborvitae is a fast growing arborvitae tree. 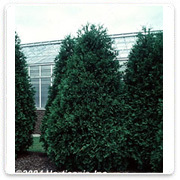 They generally have denser foliage than many of the other species of arborvitae, and make the best hedges. One of the hardiest of the arborvitae, the techny arborvitae will grow best in zones three through eight. 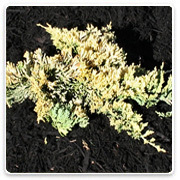 This is the arborvitae of choice for areas with tougher conditions. This is truly a great plant for miniature gardening. It has a very nice finely textured foliage that stays a brilliant gold. Well behaved and low-maintenance. Grow in full sun for best color. 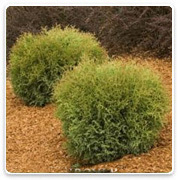 Golden flat topped bush with bronze-tipped arching foliage.Brilliant winter colour after a few frosts Loveley golden foliage makes this hardy cypress a standout in the perennial bed or as a specimen anywhere! This dwarf cultivar 'Nana Gracilis Glauca' has blue to green foliage in shell-like shapes. The plant itself is irregular but roughly con-like in shape. It typically has blunt, paired leaves with 'X' markings underneath. This plant enjoys full sun and moist soil in a cooler climate. Good plant for landscape use. C. obtusa is a medium large evergreen, under cultivation it usually does not exceed 40 to 50 feet tall, but with age will grow height. 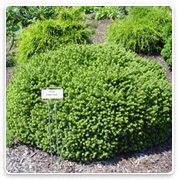 This dwarf cultivar is spherical in shape and has dark green foliage with white tips. Cones and buds are typically small and the bark is usually brown and furrowed. This plant enjoys moist soil with some acidity and plenty of sunshine. Attractive blue green foliage on a narrow column that holds form well without pruning! Excellent vertical accent, useful for landscape framing. Very durable specimen that tolerates heat, cold, drought, and seacoast exposure. Evergreen. Slow growing 10 ft. tall and 2 to 3 ft. wide. Full sun. Cutting grown. A golden yellow sport of ‘Wiltoni’. Holds its golden color all summer long. Takes full sun or partial shade. 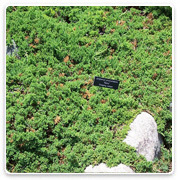 The Juniper Blue Rug, 'Juniperus horizontalis Wiltonii', is an excellent ground cover or bank planting with it low growing thick foliage. 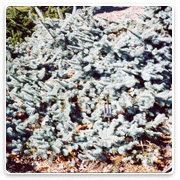 The Blue Rug is so named because of its silver-blue color and low growing habit. Blue Rug will do well in almost any well drained soil and needs moderate moisture. 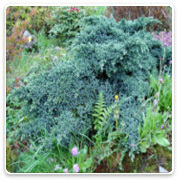 This is the lowest growing of all Juniper plants and they will even cascade over walls. Prune young shoots to encourage branching, but older branches may not produce new growth. 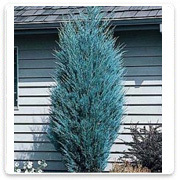 The Blue Star Juniper is one of the most popular compact or small bush junipers for garden plantings everywhere in the temperate world, truly a 'star' of a plant. 'Blue Star' has a bushy, loosely-dome-shaped form, with some projecting shoots. Sometimes it is denser and more uniform than in the illustration here. 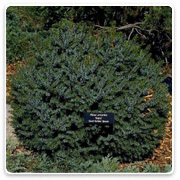 The Blue Star juniper has prickly 'juvenile'-type foliage of a silvery-blue colour. It is usually dense and well-furnished. The growth rate is fairly slow, a plant making up to 3 feet (1 metre) across in ten years, and a little less high. 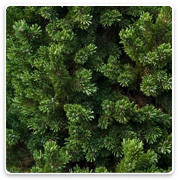 Buffalo Juniper, Juniperus sabina 'Buffalo', has soft, feathery, bright green foliage on low spreading branches that produces an interesting form, and it is an excellent groundcover plant for borders or mass plantings. 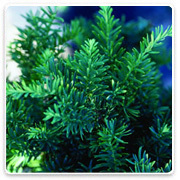 Buffalo Juniper's feathery branches are of bright green foliage; retains color in winter. May prune to shape desired. 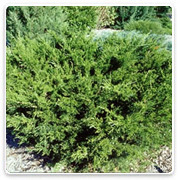 This Juniper prefers sun and a well-drained soil, but tolerates a range of soil types; drought and heat tolerant. It has a height of 12-15 inches and a spread of 5 feet. 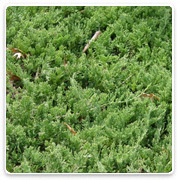 Juniper - Calgary Carpet, Juniperus sabina 'Monna', is a great plant to use when you need a lower growing evergreen, but don't like the "prickers" that one tends to associate with Junipers. Bright green in color and soft textured, the foliage of the Calgary Carpet has a scale-like appearance and is soft to the touch. The layered branching habit of this plant gives the subtle appearance of soft undulations in the ground beneath it. This is the tree that is most often used for the ubiquitous "mall bonsai". In spite of this bad press, it does in fact make a fine bonsai if it is properly trained and cared for (unlike the average "mall bonsai"). 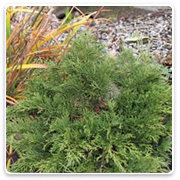 This juniper has a low, spreading habit that makes it ideal for cascade and semi-cascade styles. Specimens grown in a nursery or specifically for bonsai can be used for many styles, but probably not for formal upright. 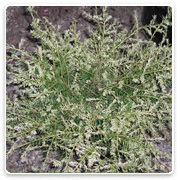 In nature it grows as a small ground-cover shrub. The foliage is bright green. 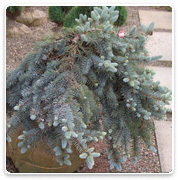 The mugo pine can be notoriously deceiving, its seemingly "cute little cushion" appearance at the garden center growing altogether monstrous in the home garden as each year passes. Not the case with Sherwood Compact. This mugo is truly dwarf with the added features of densely-needled stems accented in winter by golden tips and whitish fascicles -- overall looking like a "fiberoptic" plant! Demands little in return except good drainage and a sunny exposure. 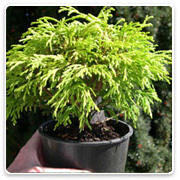 A true dwarf mugo with a dark green compact mounded form, compact enough for the most confined area. 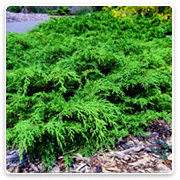 Russian Cypress, Microbiota decussata, is an extremely hardy, low growing evergreen that resembles the horizontal type junipers, but has the bright green soft foliage like an arborvitae. The foliage develops a showy bronze color in the winter. It matures at about 1foot tall by 6 feet wide, although it can get taller and much wider. It has a radiating mat growth habit and a rather slow growth rate. 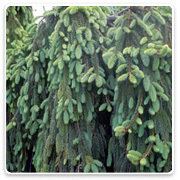 Weeping Larch is a graceful, small, deciduous conifer with elegant drooping foliage and branches. It is best to plant this tree where the roots have room to expand and unobstructed by pavement and buildings. 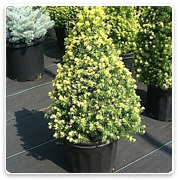 This version of Dwarf Alberta Spruce has brilliant yellow-green needles all year round. Particularly showy in the spring on the new growth, it will brighten up any gloomy spot. Can be placed in full sun or part shade, grows 2-4 inches per year. Hardy up to the most northern climates (zone 2), but prone to spider mites south of zone 7 if not watered routinely and planted too close to other tall plants. She's a sweet addition to any miniature garden setting. Pixie Dust has that familiar pyramid shape and can be used for a holiday or Christmas tree in the winter. The tiny needles on upright branches of a rich, dark green can lend itself to most garden styles. If it is warm enough, the summer’s second growth spurt is yellow – a nice surprise when you least expect it. Zone 3 Height 1.5m, Width 1.5m Shape Globular/flat topped Holds the blue color year round, brighter blue in the summer Slow growing, prune leader our to keep shape. 40cm. 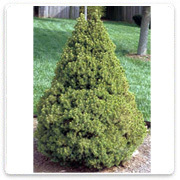 This stately evergreen conifer has stiff, horizontal branches forming a broadly pyramidal shape. Bark is scaly, purplish-gray, and shoots are orange-brown. Bluish gray-green leaves are needle-like, very stiff, thick, sharp, 4 sided, 3/4 to 1 1/2 inches long. Leaves are covered in a glaucous wax, pointed upwards and are arranged in a radial pattern on shoots. Young plants need to be staked and will ultimately grow as high as the stake. Branches then cascade to the ground and develop a sprawling, prostrate habit. 'Pendula' is an interesting and eye-catching specimen plant. 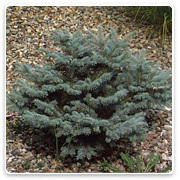 The Procumbens Spruce, Picea pungens, is a great low growing shrub with beautiful blue foliage. It looks great when draped over a rock wall or slope. This is a slow growing shrub that does best when planted in full sun. Narrow pyramidal tree with dark green needles above contrasted by silvery-white beneath. Plant in a protected spot; may winterburn. Questionable hardiness. 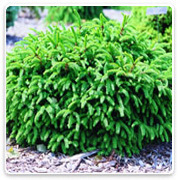 Dwarf Serbian Spruce is a dense dwarf form usually broader than tall. 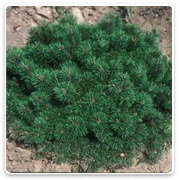 Black Spruce has a conical shape with dull blue green needles; does well in high moisture sites of eastern Minnesota. 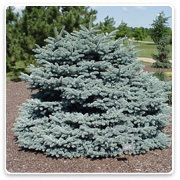 Blue Nest Spruce is a dense mound shaped form; blue green needles. Little Gem Spruce Picea 'Little Gem". This landscape evergreen is approximately 15 years old. The Little Gem Spruce never needs trimming. 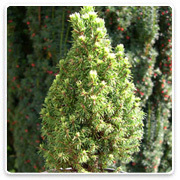 It is a true miniature conifer that fits into any landscape remaining neat looking year round. The Dwarf Norway Spruce, Picea abies 'Pumila', is a compact, broad, globe-shaped, mounding evergreen with medium to dark green foliage on branches that are pointed upward, creating an attractive broad-shaped globe. Dwarf Norway Spruce make a great accent to existing plants, and in winter, when the other foliage has succumbed to fall, they become strong focal points in the garden. This plant is very winter hardy and looks great year-round. It requires full sun with well drained soil and average water needs; water regularly; do not overwater. Excellent silver blue color and weeping form. Remains low and spreading without staking. Displays best when planted so it can weep over a wall. A very densely growing shrub form of Yew - many times twice as wide as it is tall. Nice deep green needles, with new growth emerging as a brighter green and eventually maturing to deep green. Excellent choice for use as formal hedge, takes very well to pruning / trimming. Will do well in full sun, but will really perform well if given just a bit of shade as a break from high summer heat. Likes well drained soil that is somewhat moist and slightly on the acidic side. Moderate growth rate. 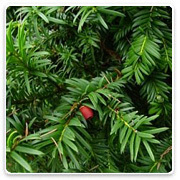 Taunton Spreading Yew, taxus x media 'Tauntoni', is a spreading evergreen that has short dark green needles and is very hardy. Taunton has a low graceful and lovely form, tolerant of summer heat, and excellent resistance to winter burn. It grows well in both sun or shade and is very popular as an accent, specimen, or foundation plant. It grows 3-4 tall and 4-6 feet wide. Yews are widely used landscape plants because of their rich, dark green evergreen foliage and versatility. They are maintainable at various heights and spreads. Remove 1/2 to 3/4 of the new growth each year with hand pruners; you can control the size and maintain a healthier shrub with a more natural form.